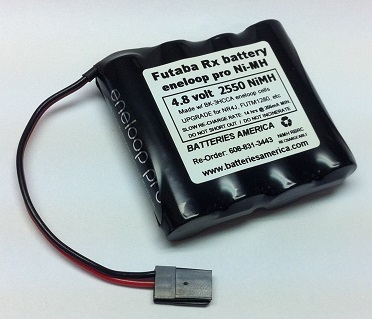 4BK-3HCCA: 4.8 volt 2550mAh eneloop pro RC receiver battery, PRE-CHARGED & READY TO USE. High-quality, high-capacity, memory-free. They RETAIN THEIR CHARGE when not in use. Choose Pack Shape (flat or Square), and choose Connector type (or just wire leads) from the menu options. Battery pack with connector is $32.95. 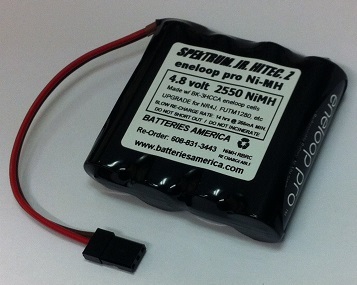 These supreme-quality battery packs are made in the USA by BATTERIES AMERICA. Dimensions of FLAT pack: 2" tall, 2.5" across, 0.6" thick. Dimensions of SQUARE pack: 2" tall, 1.25" across, 1.25" deep. Recommended chargers: Ni-Charger, YT-0006S, UP100AC, HiTEC X4AC Plus.